A photograph of the P.G. Savage family of Richmond Hill. 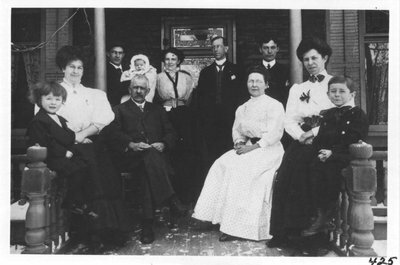 Left to right are Palmer (son of Will), Mrs. Will (Palmer) Savage, Armand with his son Peter, Susan (Mrs. Armand) Savage, Albert, William, and Mrs. Albert Savage with her son Keith. Seated are P.G. (Peter Gould) Savage and his second wife, Theodora Hillman Savage.